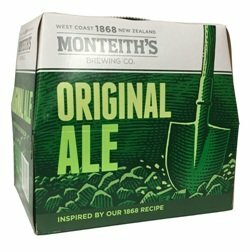 Considered to be a "New Zealand Pale Ale", Monteith's Original is a full and rounded beer dominated by hops, with notes of caramel and burnt sugars. It has a dark amber hue with an intriguing balance of smooth malt, crisp hops and a subtle berry aroma. Monteith's Original has been brewed to the same family recipe since 1868 and captures the very best of traditional English pale ales.